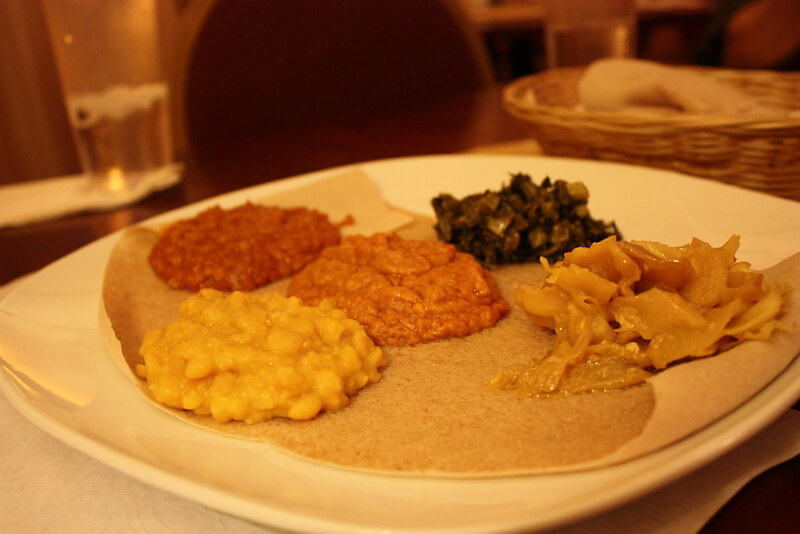 First, I love a good Ethiopian meal. I very much enjoy the experience of the meal with others. It’s great to share food with each other, by hand, from a centerpiece platter. It’s an intimate and unique experience. And it’s one of the only types of food that I can eat the plate! We waited for at least 10 minutes before anyone at the restaurant acknowledged we had walked into the door. The service didn’t really improve after we had been seated, but I loved this place too much to care. The decor was eclectic, but casual. It was warm and comfortable. The spiced tea (hot or iced) was refreshing and delicious without sweetener. It was the perfect start to the meal. I ordered the four vegetable combination. After reviewing the image above, it has come to my attention that I received all five! My favorite was the Tikle Gomen – fresh cabbage sauteed with garlic ginger and lightly seasoned with turmeric. The other items included lentils, split peas and chick peas – all perfectly seasoned. The five items were also great mixed together. The enjera (flatbread) that accompanied the food was even delicious by itself. I had to share with my date to finish my meal. This was practically under-priced at $10.50. They also offer a $7.99 lunch buffet.